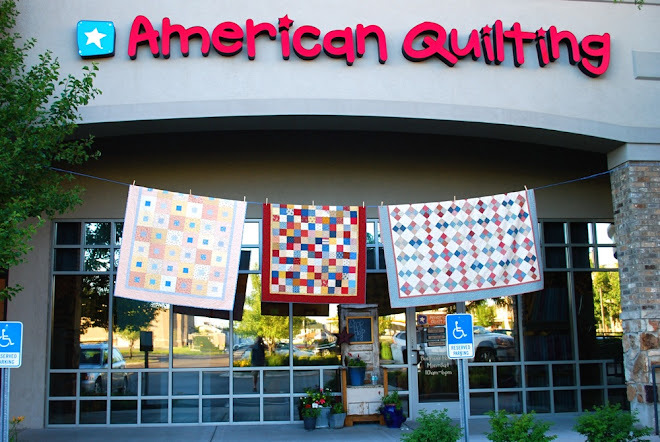 Check out this adorable, playful quilt called, American Vintage. The finished quilt measures 74" x 97"
Kit for the entire front costs $80. The pattern is sold separately. 5 3/4 yards required for the back. This one is called Sash and Dash. The finished quilt measures 63" x 63". The kit for the front of the quilt costs $65. and is made from red and black reproduction prints. costs $60 for the kit (pattern included). To order any of these kits, call the store at 801-802-7841. Don't forget that this coming week (Wed - Saturday) is the annual Wastach Front Shop Hop. We will have extended store hours (9:00- 8:00 W,Thu, Fri & 9:00-6:00 on Sat.) Come for lots of fun, great food, games, discounts and a whole bunch of new fabric in our clearance section. See you there! Love that America vintage quilt in the first pic.